Sometimes it’s hard to distinguish a truly good person from a toxic one. We tend to give people the benefit of the doubt. Most times at our own emotional expense. A good barometer for determining whether a person is helpful or harmful in your life is by paying close attention to how they respond to your fears. 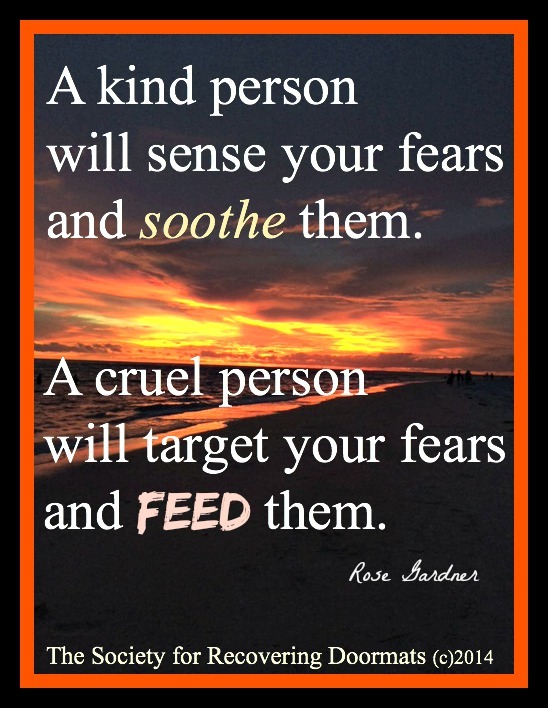 An authentic, loving and kind person will sense your fears and soothe them. A toxic, deceptive and cruel person will target your fears and feed them. This is sadly true. It has taught me to think before I speak. I was a target of evil for long enough to know that the wreckage is not easily healed. So true Cindy. Sad, but true. What an important tool for discernment. Thank you for this.